Like the crop circle in the first pic. I'll get something written up later on, then. Yeah ;) I accidentally dropped something on the test board after I laid down the grass and saw the mark it made. Crop circles were the first thing that came to mind after that, so I used a couple of rolls of tape to press shapes in while the binder was still wet. Spent some time going through the collection of LEDs I've amassed in preparation for a train project, and with re-familiarizing myself with the LED-Resistor-Voltage-Current issues. Also ended up making a set of alligator clip leads for my multimeter. 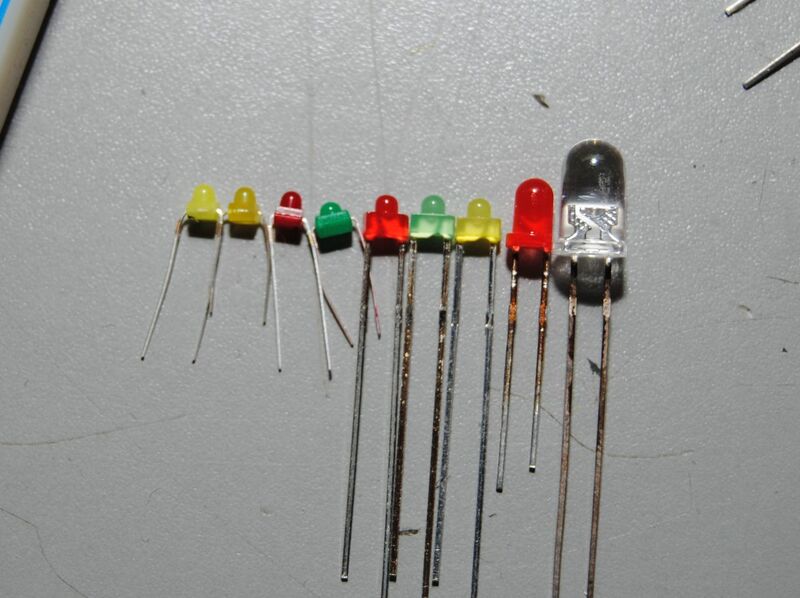 1) From left to right, diffiused 1.6mm LEDs in white, yellow, red, and green, then 1.8mm LEDs in red, green, and yellow, then a 3mm red, and a 5mm clear blue. 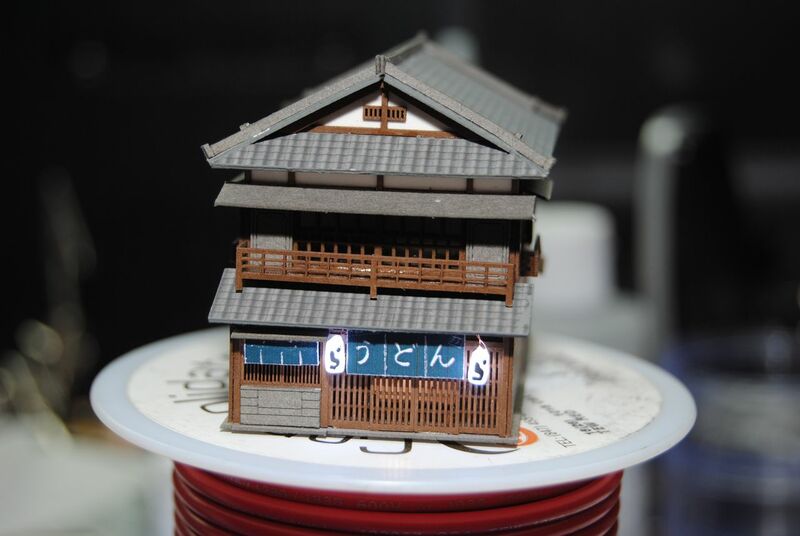 3) In case anyone doubts the scale of the last image, here it is with 3mm and 5mm LEDs for company. 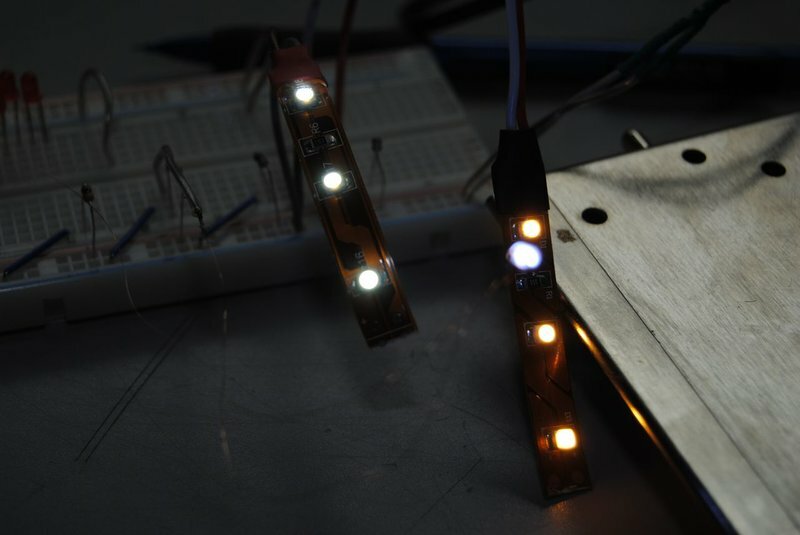 4) Here's one planned use of the 1.8mm LEDs. 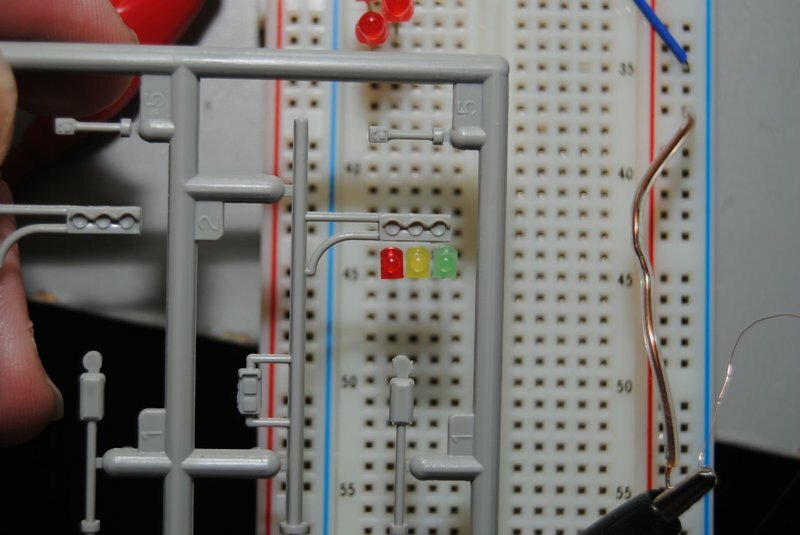 That's a Greenmax traffic light that I'm comparing them with. 5) Or, how about a Greenmax 3-aspect signal? A little oversized, but hopefully acceptable. 7) And I even have some of the fancy LED strip lights in cold and warm. 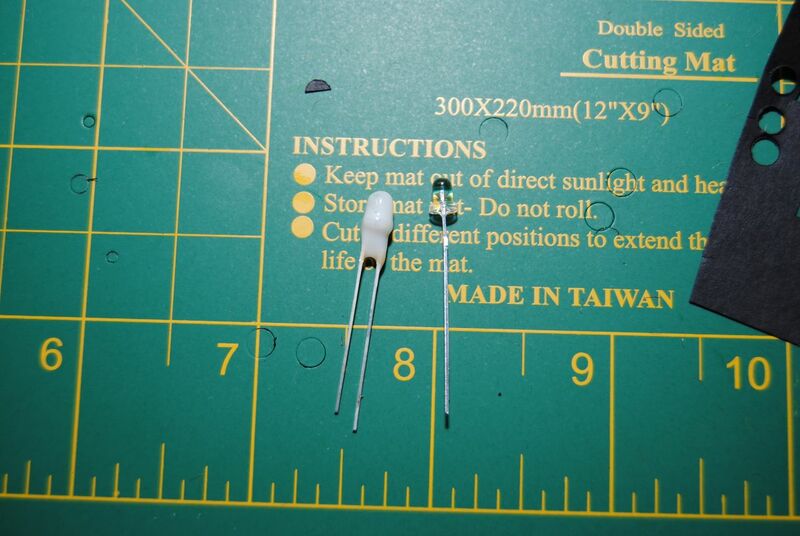 Nice job on the SMD LED. 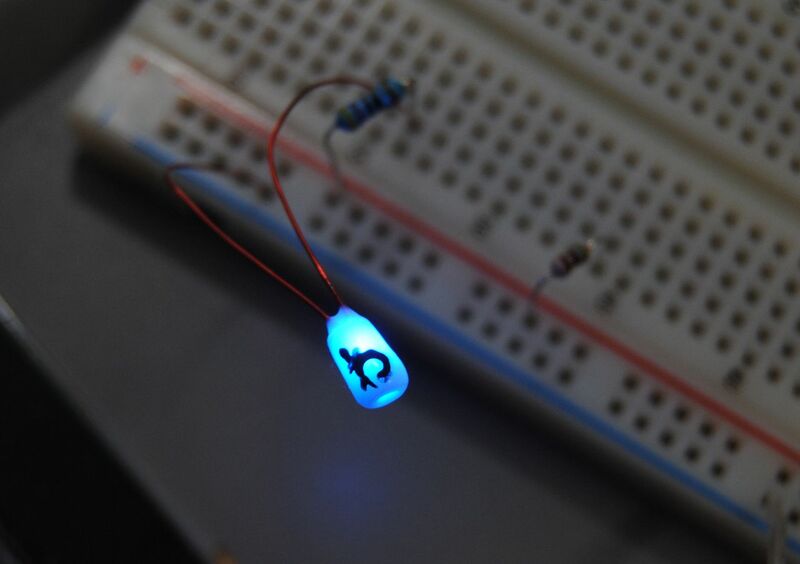 I need to figure out how to do that myself, as I want to make tracksde signals, and 1.5mm LEDs are just too large. Since I always screw up something the first time I attempt it, I'm in the habit of doing at least one practice run if possible. Yesterday, I decided to tackle my spare Sankei MP03-14 noodle shop. For starters, the Sankei kits, for what they are, are really well made and easy to assemble. There are only a couple of things I didn't like about it, and the first is the roof. 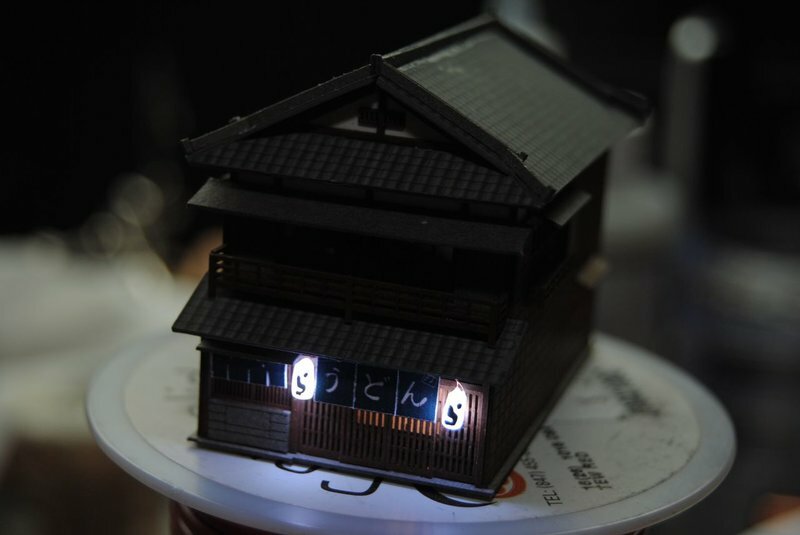 For all the ease and accuracy that the rest goes together with, they haven't got a good solution for doing the traditional Japanese tiled roof and, unfortunately, that's also the most visible part. Second, kits are very hard to illuminate. Especially if it's the first building you've ever tried to stick LEDs in. 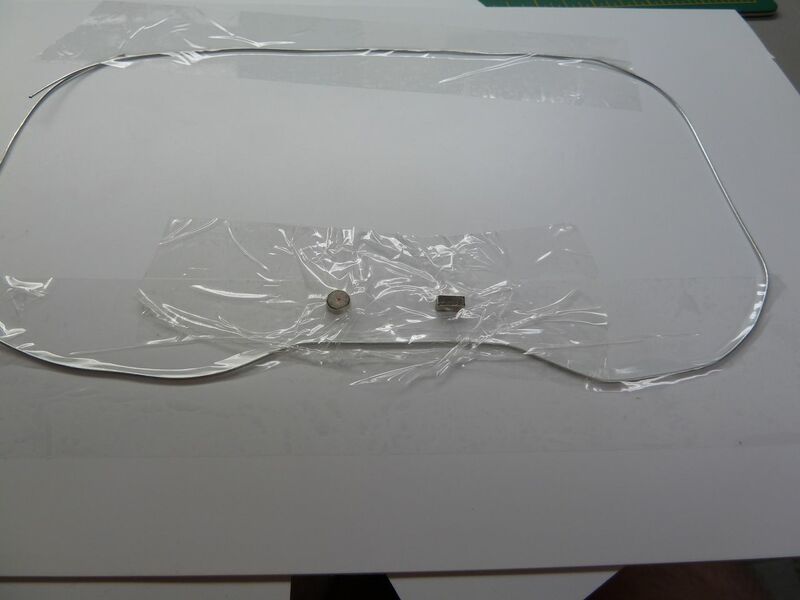 You can't exactly build a paper kit in such a way to be easily dis-assembled. I could probably have left the roof off, but it has a middle floor built in. As a result, I had to cook the lighting in as I was putting it together, so it took 3 times as long as it should have :( And the wiring is a horrible hack job. That being said, this one was only to get my eye in anyway, and I learned many valuable lessons. Not the least of which is that I don't have time to build kits and still finish in time for the show in September. I'll be focusing on the modules themselves for the next little bit, and using mostly pre-built structures to fill it out. 1) I only lit the first floor because I figured that, late at night, everyone who lived there would be downstairs working in the shop anyway. I don't think it looks right, though. 2) For the more Japanese inclined, yes the Lanterns have a "Ra" on them, and the curtain says "Udon". I forgot that it wasn't a Ramen shop, and I messed up the spare printed curtain. hey wonderful job! were the lanterns scratch built? The lanterns are SMD LEDs inside some styrene tube, dipped in Snow White Gallery Glass, then scribbled on with some black paint and a toothpick. It's a combo of stevenh's torii design and your earlier suggestion of the Gallery Glass for lenses. 1) Here's one in blue. It's still white gallery glass (I don't have any blue) but it's using a blue SMD Led (which I practice with because I got them in a 5 colour set and don't have a practical use for :P) When unlit, it's white. 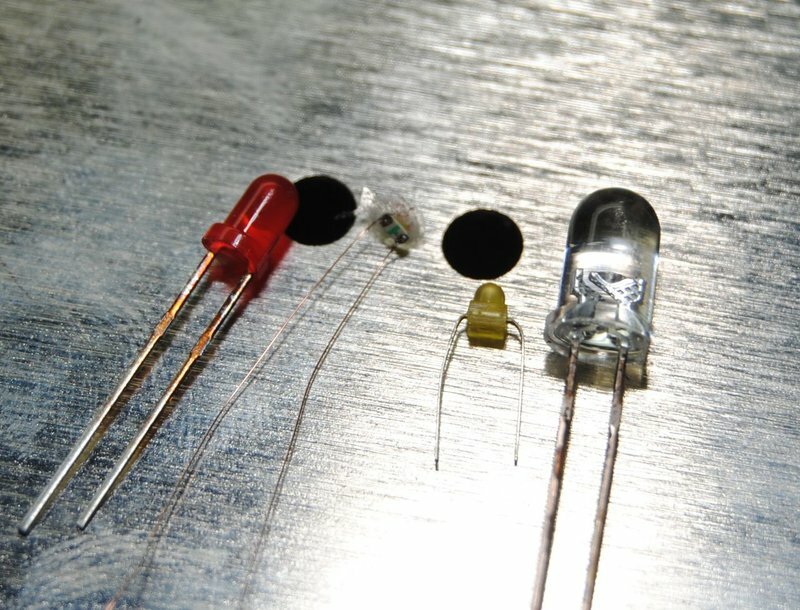 I'm going to try a red SMD led and red gallery glass later, as red lanterns are pretty common. 2) I used the same method to dim and diffuse the interior light - here's the before/after. I'll be damned. I didn't think this would actually work. Now, I have to try and dig up some more of those rectangular magnets. That one came out of the lid of an EeePC. cool glad to see this works so well with the tomytec busses. is that foam core? 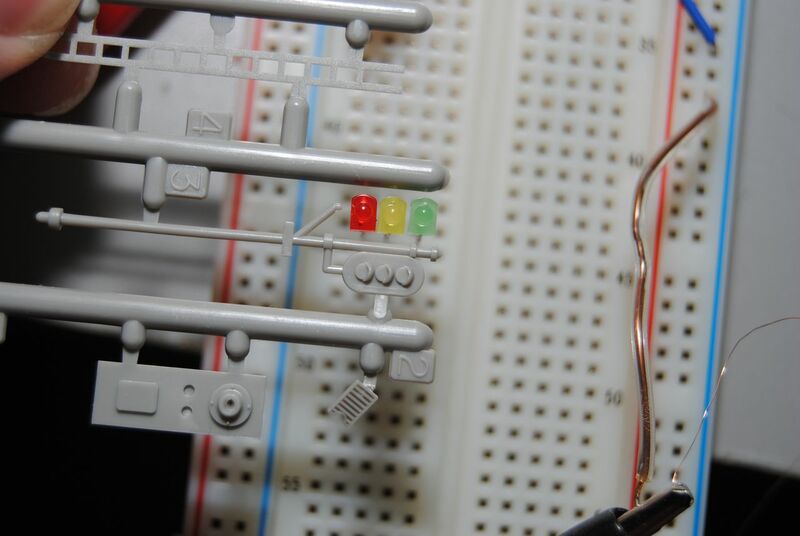 i had the faller busses doing the same w/ no problems with thin chipboard and thinner wire. i was hoping the tomytec busses would do even better as they seem to have beefier magnets on the steering mechanisms. 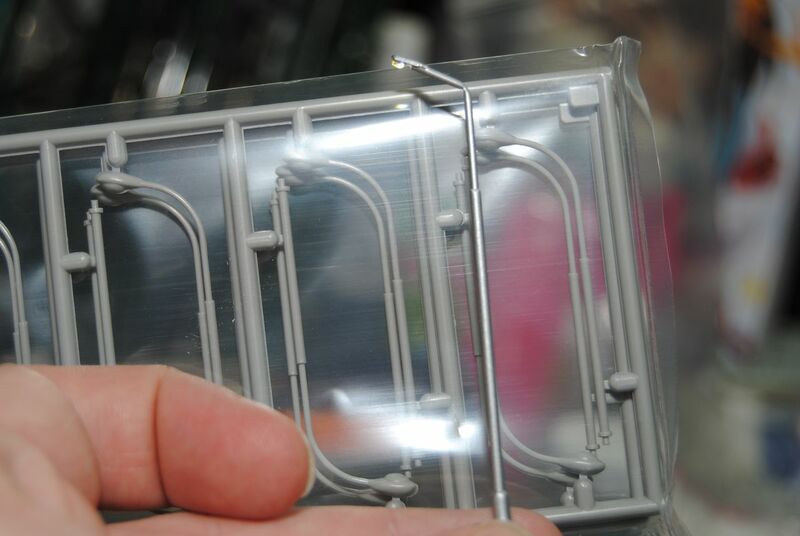 It's not foam core - it's styrene from my collection of 4'x8' sheets (AKA One BILLION square feet in n-scale :) ). 0.020" thick, I think. It's a hair too thin - the bus kept stalling so I've got another couple sheets of much thinner stock on top. 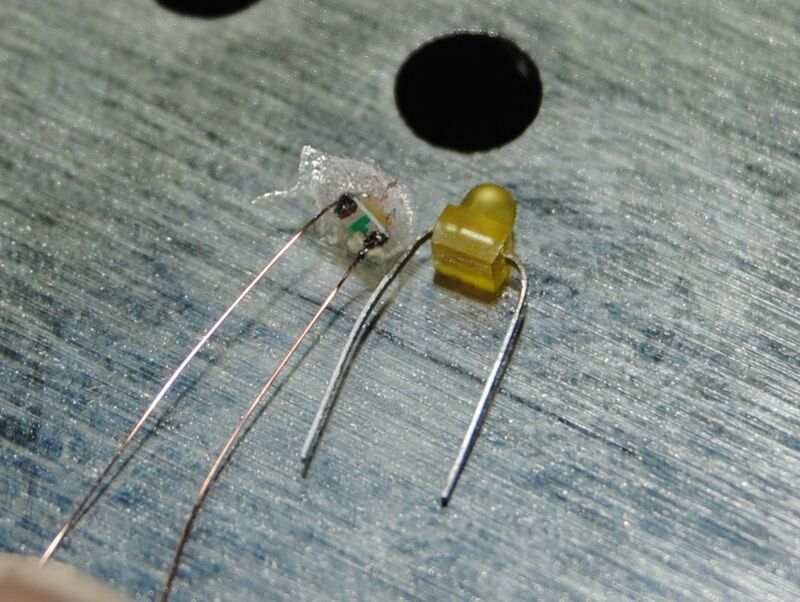 I've found thinner wire, so I may be able to get away with just the 0.020 stuff.